Family owned Miami Tour Company has been operating for over 10 years and is an award-winning company of Excellence for the last 4 years. In addition to Miami, MTC offers tours of Orlando, Key West and the Everglades. They offer 5 different tours around Miami that range in price from $32 to $69 per person. Miami Tour Company includes pick up and drop off at certain area hotels, contact them for further information. The bus tour includes an illustrated map, cold bottled water, guided tour, and an authentic Cuban coffee all in the comfort of an air-conditioned bus. Tours usually are with small groups of no more than 25 guests. The Original Miami Tour lasts for 4 hours and takes you to scenic, historic and cultural sites with 6 stops for photo opportunities. Sites included are the Miami Beach Art Deco District, Coconut Grove, Coral Gables, Little Havana, Versace Mansion, the CIA Top Secret Boat House, Venetian Pool, Holocaust Memorial, and hundreds of other locations. The Boat Tour is on their double-decker air-conditioned yacht and winds through the Miami waterways. See celebrity homes and the gorgeous Miami skyline from the water. The tour runs for an hour and a half. 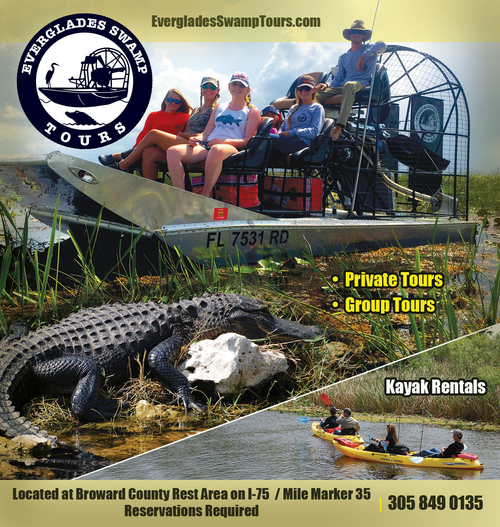 The other 3 tours offered by the company are combinations of the Boat and the Original Tour with the Everglades Tour. The Everglades Adventure portion includes a 30-minute airboat tour within the Everglades National Park and a wildlife show.